The island of Saipan has a large number of diveshops, the vast majority being Japanese diveshops. I have made an effort to list most of them below. If I have the wrong information on the diveshop or missed one feel free to leave a comment with the contact information of the diveshop in question. 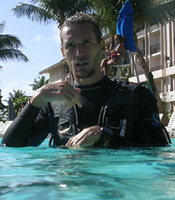 (E) - Indicates that I am 100% sure the diveshop has English speaking staff for instruction.